Vacation rental house. Sleeps 6, 3 bedrooms, 1 bathroom. No pets allowed. Best location possible! At harbor and right next to beaches and Trinidad Head. Newly furnished living room with couch and chair that are directed toward windows with a scenic view of the ocean and harbor. A great beach for small kids. Blocked from the wind and waves. Great Location near stores, resturants, and peir. This is the perfect home with the cutest nautical touches. If not interested in watching tv, there are large windows facing out to the ocean, where you can just sit and relax and listen to the ocean. Kitchen with 4 chair bar. There is no dining room in this house. Small kitchen perfect for light meals, with an island/bar that seats four. Perfect house for dining out, as there is no dining table or oven. Cozy, new comfortable queen bedroom. 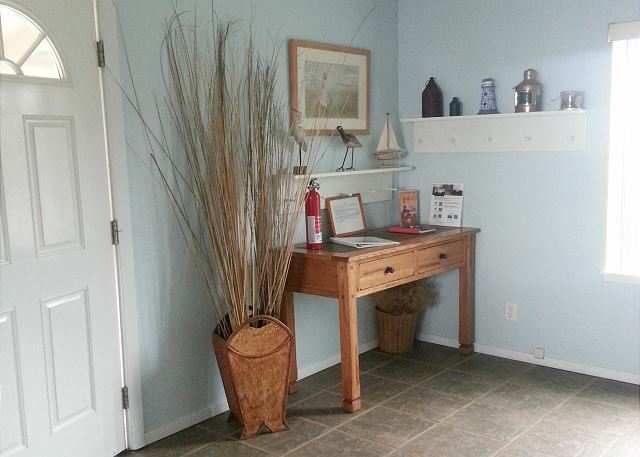 Decorative beach cottage entry way. From the moment you walk in, feels like home. Entry way close up. Nicely decorated desk area in the entry way. Perfect spot to get organized when planning your vacation. Upstairs has a large, spacious room with a king size bed. Master bedroom view, facing away from bed. Interior of home is perfectly deocrated with beach/nautical decor. Stand up shower only. No tub. 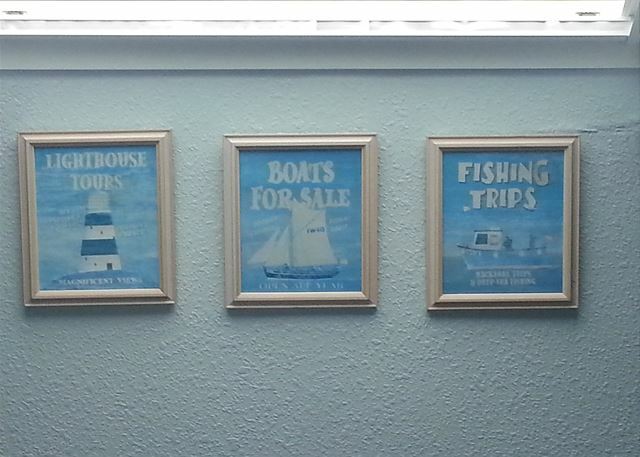 Beautiful ocean theme throughout the house, including these wonderful decorations in the bathroom. Perfect room for children. The upstairs has a small room with two twin beds. Small and cozy room with two twin beds. Perfect for kids. Downstairs room has Queen bed. Cozy kitchen has Four burners for light cooking. 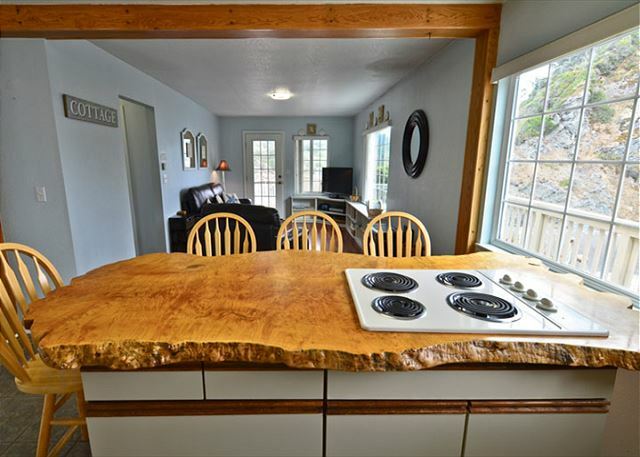 There is no oven and no dining room, as this is a small beach home. Perfect home for those who like to dine out. This 3 bedroom, 1 bath house is located right at Trinidad Harbor with incredible views - the pleasures of the sea with the coziness of home! The main house has 3 bedrooms & 1 bath. 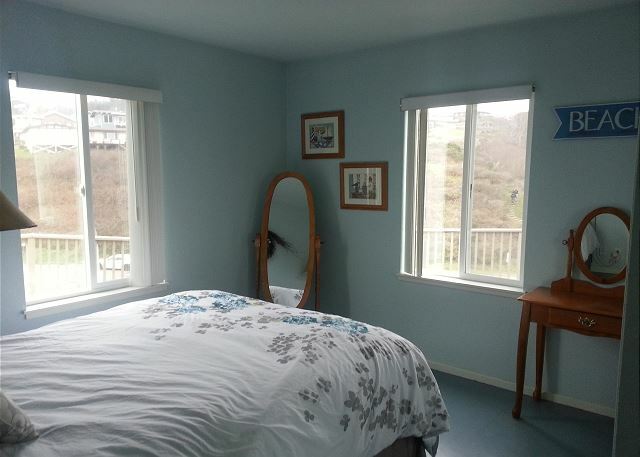 An additional 2nd unit, a large suite With queen bed is available for an additional $75 a night (http://bookings.redwoodcoastvacationrentals.com/Unit/Details/46620). 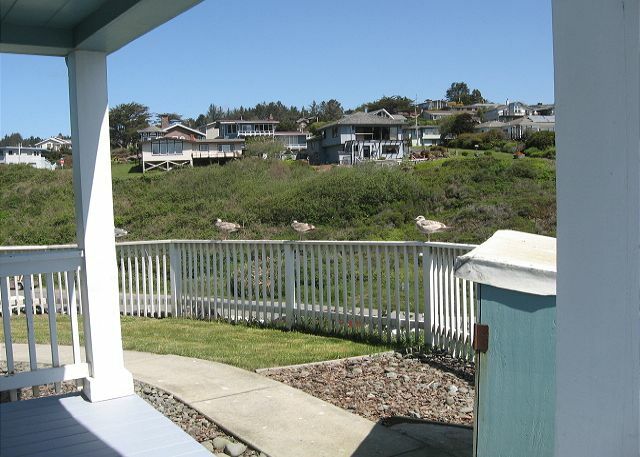 Beautiful views of the ocean, harbor, and beaches from the property and just steps to all three. You are right at the start of the Trinidad Head trail which winds around the head and overlooks the majestic Pacific (can be a great place to spot whales!). Fish all day and come back and relax in the Hot Tub. The location is perfect to be a part of this great fishing village. Footsteps to the pier were all the action is! The Seascape Restaurant is right next to the Harbor and their famous seafood dishes are a great way to end a fun day of exploring the coast, or a great way to start the day with their famous breakfasts! This house is great for dining out or for preparing small meals at the house, since there is no oven but there is a 4-burner stove and there is not a formal dining room. You seriously can't beat this place for location. Even with the windows closed we could hear the waves crashing. It was so nice to be able to warm up inside the house and still be able to see and hear the ocean. The house was pretty clean with just a few small things we noticed that were probably just an oversight. We never could get the wifi to work, even afters someone came out to fix it. We didn't really need to use it though so it wasn't a big deal. Overall the house was fantastic and I can't wait to go back again. This home is THE perfect retreat for a quiet little getaway in Humboldt County. Waking up to the sound of waves, walking the head and the beach, and the views! You’re not going to get much better than this. Our stay was perfect. It was a little chilly and the heat in the house is not the best. A few extra blankets or a good space heater would have had my rating at 5 stars a across the board. Hope to stay again! Thank you for your review and feedback of the Seascape home. This is a unique home right on the Trinidad Head. Due to the proximity of the ocean, this home does run a bit chilly, as there is nothing blocking the home from the ocean air. I did pass along your suggestions. Guest suggestions help us improve our homes, and it is much appreciated. Thank you again for choosing this home and we hope you will choose us again when visiting the north coast. What a wonderful review of the Seascape house and of Redwood Coast Vacation Rentals. It touches my heart to know that guests have found the right vacation home and they were satisfied with the company's services, too. Thank you so much for making us a part of your vacation, and please look us up again if planning a trip to Trinidad or the north coast. Great views. Smooth transaction from booking, entering property and receiving deposit back. I would definitely book again! Thank you for taking the time to write a review of the Seascape House. I hope you enjoyed your stay and please look us up again if planning another visit to the Trinidad area. Thoroughly enjoyed our stay and all the convenience associated with this home. A great experience through and through. Thanks for the nice review and for choosing the Seascape Home for your vacation. We are happy to hear that you had a great experience and we look forward to your return. Please look us up again at Redwood Coast Vacation Rentals when visiting Trinidad or the North Coast! The view is breathtaking & the house had everything we needed. It was our 2nd time staying at the Seascape & the cool climate of Trinidad was wonderful. So exciting to drive up to this rental. Love the gate since once and a while we would find people walking onto the property. Such a great location. Some of us walked to dinner the first night to The Seascape Restaurant. Great food and friendly staff. Two points regarding the upstairs king bedroom. Since it’s the converted attic head space is compact and you have to be careful not to hit your head! Also if you plan on sleeping in in the summer past 6am take sleeping masks so the light doesn’t wake you at sunrise. There is a side window as well as a skylight. The curtain on the window keeps people from see you in your pjs but definitely not a black out curtain. Glad to hear you loved the Seascape Home location. It is fun to be in the only house on the Trinidad Head, and also to enjoy the view and walking distance to the restaurant and beaches. You are correct in that this is a home for the early rise person. Sleeping in is difficult here. Thank you for choosing this home and having your vacation in Trinidad. We hope you will return to visit us again soon. We wanted to hit the west coast and the Redwood National parks and we wanted a beach experience. This charming little house worked great, giving us privacy, great views and access to two beaches. It was colder than we expected so we didn't swim, but the family loved walks on the beach, finding starfish and anemones, and exploring the rock formations.We ate at the Trinidad Eatery and Gallery, wonderful food. Visited the Research aquarium down the road, that was quick and informational. The other benefits of this rental were laundry facilities (thank you, made for lighter packing) Murphy's Market was great shopping for late night meals, hot tub for cool evenings. Pretty location, clean and welcoming house and easy access to other cities and parks. What a wonderful review of your stay here in Trinidad and of staying at the Seascape Home. With this having been your first time to Trinidad, we hope you will return again for many more vacations to come. Thank you choosing the Seascape House and for booking with Redwood Coast Vacation Rentals. Crows nest of the harbor. Thank you for your recent stay at the Seascape House. Please visit us again soon. We had a wonderful and relaxing vacation in Tinidad. Seascape has got to be the best location in the center of activity in Trinidad! The Seascape Home is a unique home to stay in. While the rest of Trinidad is looking away, towards the ocean, this is the only home which has both; you can stare into the ocean for days or turn around and view Trinidad. Glad to hear you had a wonderful and relaxing vacation. We hope this means you will be back to visit us again. We had a great family vacation. The house was cozy and clean. The location is absolutely amazing! Thank you for choosing to spend your family vacation at the Seascape House. It is a very cozy house perched above the pier, with a stunning view of the harbor. Definitely an amazing location! We are glad you all had a great time and we look forward to accommodating you, should you choose to visit Trinidad again. We had a wonderful time at the Seascape. Beautiful views, close to the beaches, no homes next to us. The property managers even mailed us some items that we had accidentally left behind! A few draw backs were not having access to the washer / dryer since we only rented the home and not the suite next to it, and the internet was very unreliable (which for some could be a good thing I guess). Overall we loved our time here! Thank you for the review of the Seascape home. 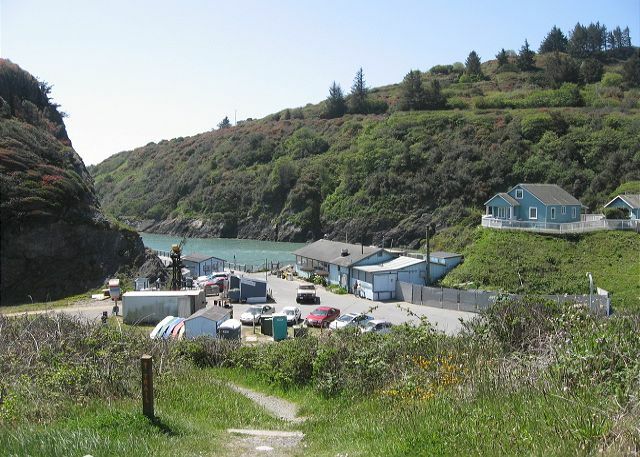 It is the only home on the Trinidad Head, which is close to the beaches, harbor, and dining at the Seascape Restaurant. I really wish you had called regarding the laundry room. That is fully accessible for guests and the suite need not be rented for access to the facility. We would have rushed over to see why the door was locked, as we always unlock it for our guests use. Again, we thank you for choosing this home and we do hope you will return to visit us again soon. All six of us enjoyed our vacation rental, it was exactly like the pictures. We truly wanted a place right on the beach and this meet the request. We were happy to find that the rental was stocked with items that would be needed for cooking and impressed that the outside patio chairs were purchased for out stay. A pleasure to hear you had an enjoyable stay at the Seascape Rental. Our guests' experience is very important to us, and when we received your request, the timing worked out beautifully for us to be able to make accommodations for you. We do hope you will return to visit us again and thank you for choosing this home. Thank you for your recent stay at the Seascape home. I have stayed at some ski house regularly over the last decade. 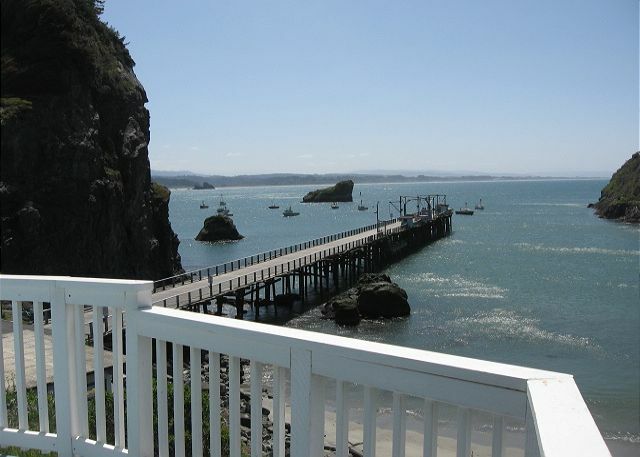 The house is perfectly located at the end of the Trinidad Pier making for fantastic views. 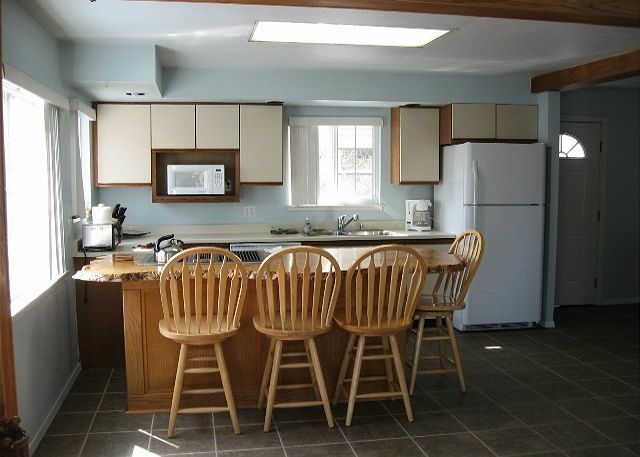 It is also convenienly located to three beaches and a headland trail head. Location makes for a very scenic and peaceful stay. Although the house itself is old and the Wi-Fi is not very strong, all the beds are comfy and the propane fireplace heats the house up very well. The management make sure the hot tub is clean and that I was all settled in comfortably. I highly recommend this location for any Oceanside retreat. Thank you for being a repeat customer to the Seascape House. We are glad you enjoy the home and find it comfortable and convenient. We do look forward to your return and providing you with a scenic place to stay in Trinidad. Fantastic time, wonderful location. Will stay again. 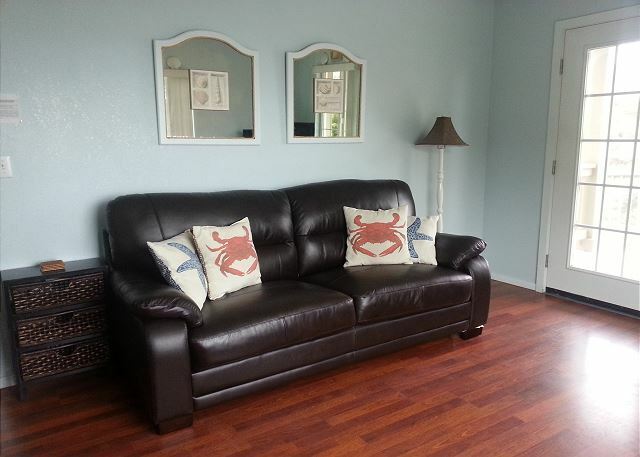 Thank you for booking with Redwood Coast Vacation Rentals and choosing the Seascape Home for your stay. We look forward to accommodating you again in the future. This home is so comfy & the location just above the pier is perfect. You can walk to the restaurant below & also walk to go fishing. To sit on the deck & watch the boating activity was so much fun. The home is furnished nicely. It's perfect being able to rent the studio for extra guests. Love this place & we will return soon. We can't wait to have you back! This is the only home on the Trinidad Head, which is such a treat! 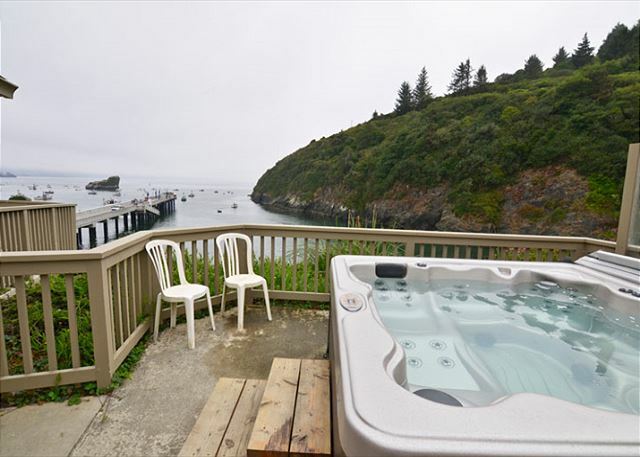 You can sit out in the hot tub outside, watch the boasts come in and out, walk the Trinidad Head Trail, go down to the Seascape Restaurant, stroll down to the beach, or just go fishing yourself. Definitely a great place to stay when visiting the coast. Thank you for booking with Redwood Coast Vacation Rentals and we look forward to your return. Delightful vacation cottage! Very welcoming, fully equipped, close to everything. Thank you so much for reviewing the Seascape House and for choosing Redwood Coast Vacation Rentals. 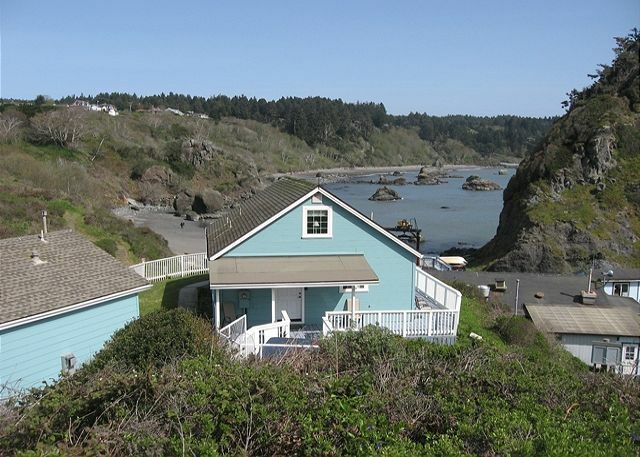 This is such a unique rental, being located right on the Trinidad Head, we appreciate your kind description and hope you will be back to visit us again soon. We had a lovely time. I would suggest that you have both types of coffee available with the Kernig machine. There was only decaf and we brought coffee but the coffee pot did not have a pot.b. Also I think there should be detergent for one load just to get us started. Other than that it was great! The view takes your breathe away! The property was clean and had everything you needed. You had to let the hot water heat up but We loved staying in the heart of the bay! The Seascape House is unique place to stay, as it is the only home on Trinidad Head. And Wow, what a view to enjoy! Thank you for booking with Redwood Coast Vacation Rentals and we look forward to your return. Thank you for choosing the Seascape House and for sharing that you had an enjoyable stay. What a great home for a family to stay at while visiting the beautiful scenic Trinidad. We hope you will return to visit us again, here at Redwood Coast Vacation Rentals, and we look forward to accommodating you again. Pros:peaceful, best location, great views,nice hot tub, washer and dryer very helpful, with the sandy beaches in walking distance! Cons: steep stairs to second floor, beds are a little on the hard side. Would definitely stay again. What a unique place to stay in Trinidad. The Seascape House is the only home on the Trinidad Head. It is an older home, this may account for the steep stairs, but what a great place to look out over the Trinidad Pier and watch the boats go in and out of the harbor. Thank you for staying with us and choosing this home. We hope you will return to visit us again, soon. The Seascape truly offers a one-of-a-kind location with immediate access to the bay, ocean, and trail head. There isn't a better spot to stay at in the Trinidad area. Thanks, Chris, for the review of the Seascape House. What a unique spot to get to stay in while visiting our lovely coast. Thank you for choosing this home and we hope we can accommodate you again. Our Fourth Stay At Seascape! We had another wonderful visit to Trinidad. You can't beat the views from Seascape! Great restaurant a in the area...Carmelas, Larrupin, Seascape Restaurant,Trindad Bay Eatery, and Lighthouse. We hiked along the beach. It was a great vacation and we hope to come back for a fifth time! Thank you for being a repeat guest to the Seascape House! We can't wait to have you back again! Fabulous and will never forget it. Like paradise. Thank you for choosing the Seascape House. What a unique location to be able to visit our area, right there on Trinidad Head. Thank you for choosing Redwood Coast Vacation Rentals and we look forward to accommodating you again. Thank you! 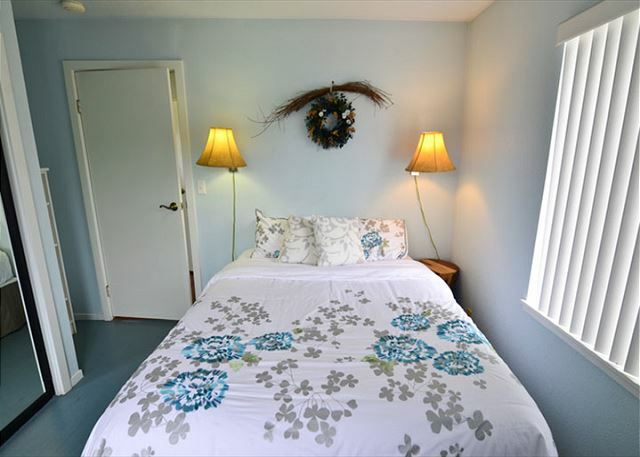 Redwood Coast Vacation Rentals has over 100 rentals in all price ranges. Something for everyone! The house was very nice and cozy. Had everything we needed. Beautiful views. The stair well is narrow steep beware for children or grandparents. We really liked it and would rent there again. Thank you for choosing the Seascape House for your Trinidad getaway and we hope you will visit us again. This house was gorgeous, only 30 mins from the red woods and right on the beautiful coast. We went agate hunting at Patrick's Point state park and the hottub overlooking the water after a 13 mile hike in the redwoods was amazing. Happy to hear you had a great time while staying at the Seascape House. 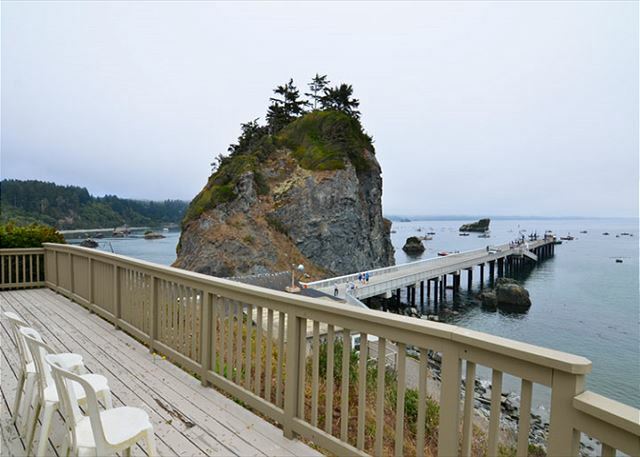 The is one of the unique properties here in Trinidad that is actually on the Trinidad Head and overlooking the Pier. Perfect place to settle at night while enjoying hiking and agate hunting during the day. We thank you for booking with Redwood Coast Vacation Rentals and look forward to accommodating you again in the future. We had chosen this property as my husband and his partner were entered into the Trinidad Rockfish Kayak Tournament and it was a perfect location. However, the tournament was cancelled due to weather, a nasty storm with high seas. We decided to make the best out of the weather and vacationed anyway. We found the house warm and inviting. A fire was going in the gas fireplace when we arrived. We "hunkered" down for the weekend with good food and wine. The kitchen was well equipped with cooking and serving pieces and the house was perfect for watching the storm. Looking forward to another trip but with better weather conditions so we can enjoy the beaches!! Sorry to hear about the Rockfish Tournament cancellation. We did have quite a storm and I am happy to hear that you were still able to enjoy your time here storm watching. I find the seas to be quite exciting to watch during a storm, myself. Thank you for choosing this home and for hanging in there! I hope you will return to visit again. We have been renting vacation homes from Redwood Coast Vacation Rentals for 9 years, and we have stayed at the Seascape for the last 2 years. 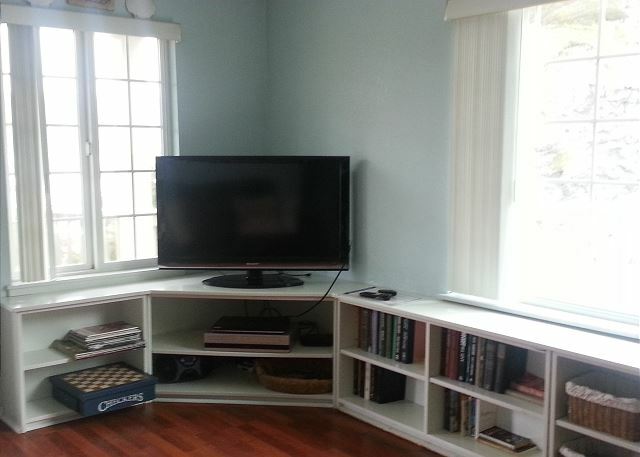 This house is in a great location and is walking distance to the beach, restaurant, and shopping. The views from the house are amazing and the house is very comfortable. We will be back next year for sure! Thank you for being a return customer to Redwood Coast Vacation Rentals. If you have stayed at the Seascape home for past two years, then you have seen some changes there :). That home is definitely in a unique position and such at treat to stay at. We look forward to having you return to stay with us! Thank you for booking the Seascape House for your vacation. Please visit again. We were impressed by how well stocked the kitchen was with dishes, cooking utensils and pots and pans. There was a good supply of towels and having a washer and dryer available was a bonus! The views from the property are awesome. We brought our own lounge chairs and had fun relaxing on the back deck while we watched the fishermen come and go from the pier. The only negative experience would be the ants in one of the bedrooms upstairs and a few bugs in the suite. However, a few bugs won't keep us away from this place! We will definitely stay here again! The Seascape House is such a treat. To be able to sit there and stare at the ocean and watch the fishermen come and go is always fun. We were shocked to find the ant situation upstairs upon check out, and we did address them right away. While ants and pill bugs are a bit of a battle during certain seasons here on the north coast, finding them upstairs was a surprise. We are are glad to hear that it didn't deter your feel of this place and we do look forward to having you stay with us again! This was our second stay at Seascape in Trinidad. What a great location, in the middle of all the activities! The house was very clean and had all the kitchen utensils we needed. The view from the living room window is just awesome! We hope to return soon. We hope to have you back! We just added a new coffee table and an end table by the chair, so it is already improved for a return visit, lol. Thank you for staying with Redwood Coast Vacation Rentals again, and we always look forward to return customers. Not ONE thing to complain about. Perfect location! Pictures do not do it justice. There is not a better location in Trinidad! We will be back! What a great review of the Seascape House! Thank you! I hope we will see you again. We absolutely enjoyed our time at Seascape. The views were spectacular, the house is special and quaint with plenty of room for five of us. Loved cooking in the kitchen. Views everywhere! The hot tub was a perfect ending to each day. And the town was charming with very kind and welcoming people. We loved our time here! Thank you for the wonderful review. The Seascape House is a special location to stay, right there on the Trinidad Head like that. In fact, I think it is the only home on the Head. What a view and to sit in that hot tub overlooking the harbor...What a treat! We thank you for staying with us at Redwood Coast Vacation Rentals, and we hope you will return to visit us again soon. Our Canadian friends arrived before us and had no trouble finding the spot- it's the only one up n the hill with the awesome view! The house was cosy and delightfully furnished- we really felt like we were at a beach getaway, while also feeling right at home. The kids loved the little bedroom upstairs. The weather was cold and rainy but the hot tub was perfect! 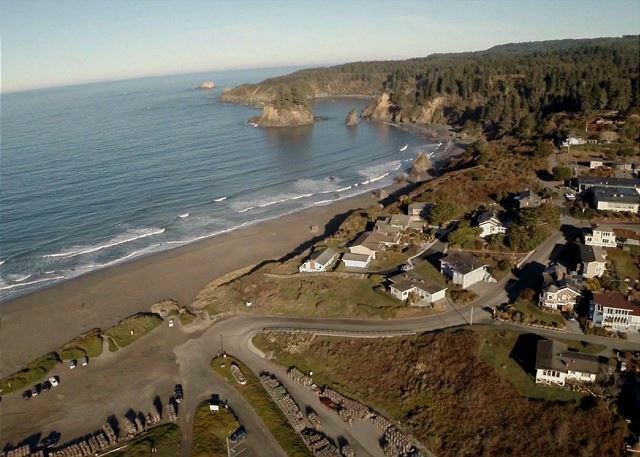 There's no better view of Trinidad Head- it's right in front of the house! You can spot oyster catchers and grebes without binocs! All in all it was a great time except for the weather. Only suggestions I have were to perhaps install a toddler gate at the top of the stairs because they were a bit steep - we had 4 year olds sleeping in the room so they weren't a big deal, but younger children may have trouble negotiating the steps. Also, the shower went from extremely hot to extremely cold at the flick of the wrist, so we spent ages finding the "sweet spot"- especially important if you have kids using it, they could get scalded pretty easily. We loved it though and would come back tomorrow. Thank you for the wonderful review of the Seascape House. It is a cozy home and the location is great for viewing. Personally, I enjoy watching the ocean and weather on stormy days, but maybe not so much if I were on a vacation :). Thanks for the suggestions and I will definitely have maintenance check out the hot water situation over there right away. I hope you get a chance to visit us again on a less rainy time of year. Late summer and early fall tend be really nice, just fyi. Thank you again for booking with us and we hope you visit again. Everyone loved the home! Plenty of linens! Hot tub was clean - I tested it, I brought my own strips from home as I need to know water is ok and it was spot on! Heather and Stacey from the rental company are great too. Family time at the Seascape House sounds like a blast. Thanks for mentioning the hot tub; we do service between every guest, and with the location right by the sea, we have to keep a constant eye on that one. Thank you so much for noticing! Glad you loved the home and I hope you will get the chance to make it back to visit us again, here at Redwood Coast Vacation Rentals. We hope to see you back! Thank you for booking the Seascape House and we look forward to your return. We rented this house for the first week in January--not the typical time to visit the beach, I admit, but we had hoped for some stormy weather and we loved it. This house was right above the waves--I couldn't have asked for a more perfect location. From different windows, you can see not one, not two, but three different beaches! It's located at the top of a little hill, so it feels very private. The beds were very comfortable--plenty of towels and pillows. It was wonderful and relaxing, listening to the waves at night, and the rain on the skylight. We found the place to be very clean and pleasant. Around the hill, below the house, is a great restaurant right on the water, with really good breakfasts. We also enjoyed the Trinidad Museum as well as several lovely art gallery/crafts/collectables shops. Eureka is only about 15 miles away for more restaurants and shopping. I would recommend this rental to anyone, and I certainly plan to rent it again myself! Thank you for the wonderful review of the Seascape House. I am pleased to hear that it worked so well for you and we do hope you will come back to visit us again. This stay was fantastic! We had our own castle on the hill! We were so pleasantly surprised at the unique location of this home! We enjoyed our stay in Trinidad and would recommend it to other friends and family! Thank you so much for offering it for rental! I am so glad you had a fantastic stay at the Seascape House. Redwood Coast Vacation Rentals thanks you for your booking and we look forward to having you stay again! Seascape was everything we hoped for and more! The view is spectacular from all windows with the sounds of the sea. We were never bored, hiking, sightseeing, walking the beach and pier. Saw otters and sea lions from the windows. Just lovely! Seascape was clean and inviting, we enjoyed it immensely! My sister stayed in the suite and was also pleased. She hopes to come back again. The hot tub was the perfect end to our days, heaven on earth with the View. We had to change dates on the suite, Heather was very helpful and happy to accommodate. We went to Seascape Restaurant, Trinidad Bay Eatery, Lighthouse, and Larrapin. Enjoyed them all! We spent one week and that was not enough, hope to come back soon! Wow, sounds like you had a wonderful time while staying at the Seascape House! I am so pleased to hear this; and to see otters, too, that is a treat! I do hope this means you will be back to visit us again. This is such a great place to be! My beautifu bride and I stopped here on the 2nd leg of our honeymoon, and it is a place we wished we would have booked for longer! Seascape was such a nice little cozy beach house! It was clean, although we had to kill a few spiders before settling in. Trinidad is a great little town, and seascape is the best place to stay if you want some relaxation. The hot tub was great, and although there are many reminders to rinse off (which we obeyed) there was still sand in the hot tub. Not a big deal for us though. We enjoyed hours relaxing in it. The only complaint we could muster, was one night we decided to leave the window open to cool off (no air conditioning). When on vacation and after staying up late with a nice bottle of wine, the garbage truck below at 7 am is a poor way to wake up in a peaceful beach house. But, I got up and closed the window and we fell right back to sleep for a couple more hours. The beds are comfortable, we used the queen downstairs because it's closer to the bathroom. All and all, a good stay. We may visit again someday. Congratulations and I hope you had an amazing honeymoon! The Seascape House is a neat place to stay. No one has ever mentioned the garbage truck, so maybe I should make a note in our informational binder about it. Thanks for letting me know. If you like Trinidad, we here at Redwood Coast Vacation Rentals, have over 60 homes in quite varying environments you may want to check out. May an Anniversary trip in the future?! Thank you you for stay, and many blessings to you. This is a great house within walking distance to the beach. 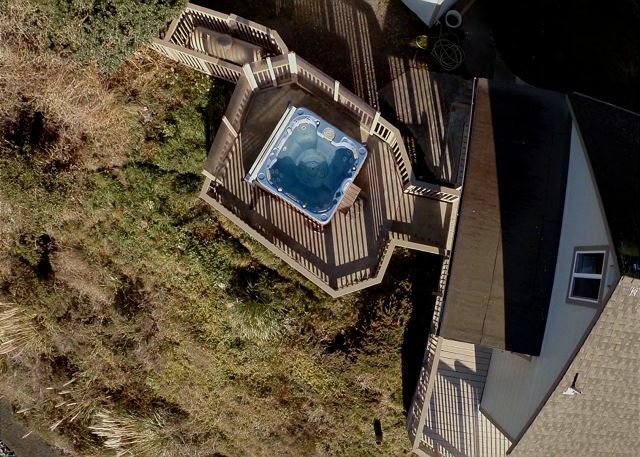 The hot tub is amazing and it's fun to watch all of the activity on the pier from the inside of the house or the deck outside. We will definitely be back! And we look forward to having you back to the Seascape, as well! Such a wonderful beach house and you can't beat a hot tub overlooking the pier. Thank you for your stay! Seascape House is such a treat to be at. Sometimes it is fun to just sit and watch the activities in and around the pier. Redwood Coast Vacation Rentals thanks you for your stay and we always look forward to return customers. If you ever want to experience a different environment, we have over 60 vacation homes you may want to explore, as well. We stayed here two nights and could have stayed longer. The house was comfortable and convenient with a great location! Directions to the home were clear despite being a difficult place to find. Would love to stay here again! Stay8ing at the Seascape House can be such a treat. I hope this means you will get a chance to return and stay a little longer next time. Thank you for your stay! I hope you will get a chance to return soon. Our family had such a great time enjoying this rental! We rented the main house and suite for our family of 7. Both units were clean and well appointed. The description of the property and units was very accurate. We experienced exceptional customer service. We enjoyed the Sequoia Zoo (in nearby Eureka), the Seascape restaurant (walking distance), morning and late evening walks on the beach, the Trinidad trail (right outside the property), the completely fenced property was amazing for our 3 young grandchildren, the easy access to the main beach and the calmer pier-side beach, the HSU marine exhibit (right up the hill), and a craft fair outside the local market. We would definitely recommend this rental and, should the opportunity arise in the future, would enjoy a return visit! Thanks for the memories!! Wow! 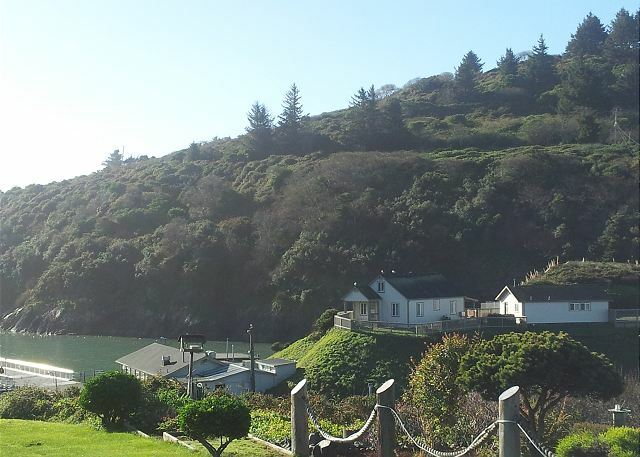 Sounds like you had a wonderful time in our area, while staying at the Seascape House. I am so happy to hear that you did so much during your stay. 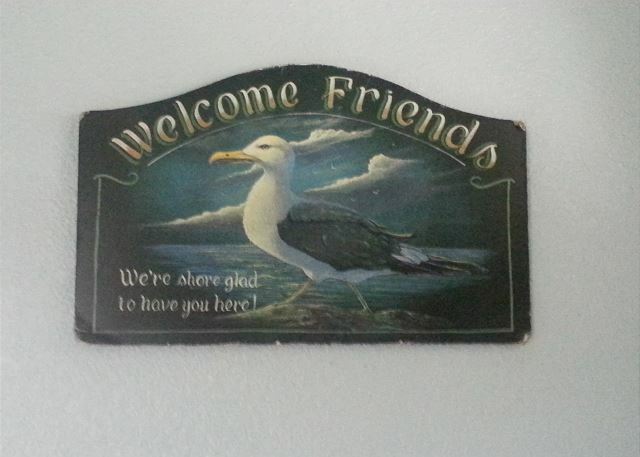 Redwood Coast Vacation Rentals thanks you for your stay and we definitely hope we get to see you again! Our family stayed here recently and had an amazing experience. The house was in great condition and the view is breathtaking! We enjoyed walking on the beaches nearby and down on the pier. The restaurant located down the road from the house is wonderful and has easy access. Everything was in working order and we highly recommend this rental! Thank you for the review of the Seascape House. 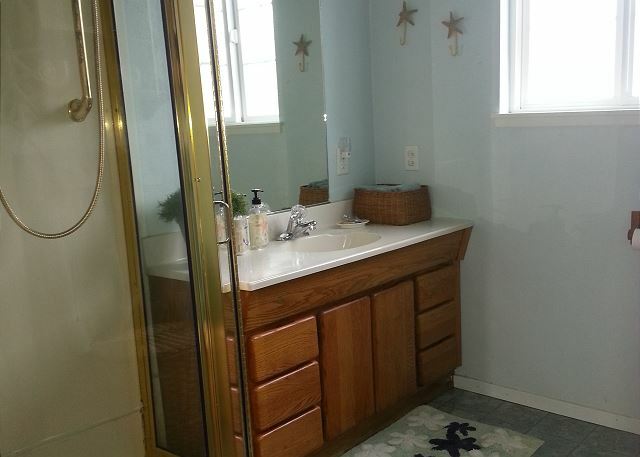 Such a treat for your family right above the pier and walking distance to the beach. Please visit again! Beautiful Location right on the harbor. We arrived late our first night. Everything went very well for us. The code to the lockbox worked great and we were able to easily access the keys. The location is amazing and we loved all of the sights, sounds and smells of the harbor. The only reason we didn't give the property's general condition a full 5 starts is that the home is old and dated on the inside. However, that was not an issue for us the location makes this property what it is. The stay here for 3 nights was our kids favorite part of our trip. They can't wait to go back and I would definitely recommend this place to all my friends visiting this area. Seascape is a unique house right by the harbor, I am glad to hear it worked well for you. The house does take a beating right next to the ocean and the interior does have the rustic, beach home theme. As all the beds and living room furniture were all just replaced with new furniture last year, I would love to email you privately to hear your thoughts. Otherwise, we would love to have you visit us again! Wonderful place to be able to watch the goings on of a small town fishing village. We had the opportunity to walk to multiple beaches and a fabulous restaurant right below the house. Took advantaged of the hot tub to soak and watch the harbor as boats and sea lions played. House was nice, a little spare on furniture in the main room, coffee table would be helpful for placing drinks and things. Would recommend to those looking to relax and enjoy time at the ocean without crowds or schedules. Seascape is great house for people who like the ocean view and easy access to fishing and the pier. I have been working on trying to get a coffee table there, so thanks again for reminding me so that I can bump it to the top of the list again. Thanking for staying with us, please visit again soon. 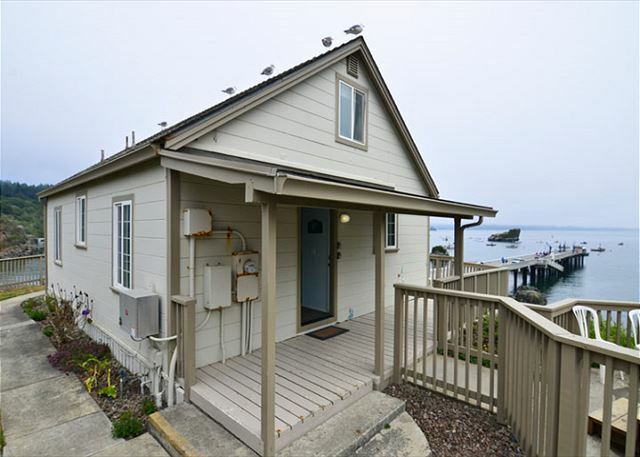 The house is in a great location; within site of the harbor and less than a 5 minute walk to the beach and the Trinidad Head loop trailhead. The house itself is clean and comfortable. The second floor stairs are steep and the floors creak and moan as you would expect in an older house. There are ants in the kitchen, but being right on the beach, it is to be expected. Just make sure to wipe up all your crumbs and keep food packages sealed. The hot tub was hot and clean. I noticed a guy came to check and add chemicals while we were there, so it’s good to know it’s maintained on a regular basis. Overall, we were pleased with the property and would stay again. Thank you for the review of Seascape House. 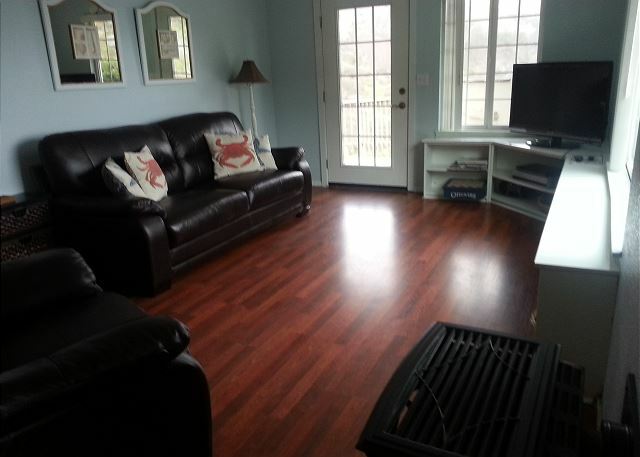 What a great spot, so close to the harbor and beaches, it is comfortable, rustic beach home. Thank you for letting me know about the ants. Yes, definitely a problem in the whole area this year. We will begin treatment immediately. We are glad you were pleased with the property and I do hope you will return again, to Redwood Coast Vacation Rentals. Wonderful, one-of-a-kind location. Old home but clean and comfy. We thoroughly enjoyed our stay. Thank you for staing at the Seascape Home. Definitely a one of a kind location. I am glad you enjoyed your stay. Will definitely return for a longer stay! Thank you for the review of Seascape House! What a neat place to stay. Sounds like may be you need to visit us again. We, at Redwood Coast Vacation Rentals, appreciate your stay with us and look forward to your future return. Great spot for family get togethers. Loved it. Thank you for your review of the Seascape House and for staying with Redwood Coast Vacation Rentals. Glad you had a wonderful time! It was a great over all exeriperience. It was a beautiful location. Right near the peir and ocean. The only thing, some of the lights didn't work. But we would defiantly stay there again. I am happy to hear you had a great experience at the Seascape House. It really is in a beautiful location by the ocean and Trinidad Head. Sorry to hear some of the lights were not working. In the future, call us right away and we will check out any burned out bulbs. Again, thank you for your stay, and we hope you will return to visit us again soon. We had a great time and enjoyed every moment. The Seascape was a perfect choice, and I am very glad I chose it! My Daughter, 3 grand-daughters and my great grand-daughter all were on this vacation. The only complaint that I have is that most of the window blinds did not work, some broken even. The upstairs blinds behind the king size bed broke the 1st day there when we wanted to look out the window. There were some ants in the kitchen as well. But other than that it was great. Will want to stay again someday and would recommend to all. Thank you for the review of Seascape House. I am pleased to hear you had a great time at the house. The blinds have become quite a challenge to find, as sizing and styles change, but we have been working on it. Unfortunately this time of year, as the cooler weather transitions, ants do make their way into homes to escape the cold. One of many critters that many of us have to deal with up here on the coast this tie of year. I will see to it we have some treatments in the house. Again, thank you for you stay and I do hope you will return to visit us again up here in Trinidad. We enjoyed our weekend stay. The management company was friendly & efficient. As you read other reviews, the outside of the house is tired and the inside, although nice....bathroom is good, beds are comfortable and the entire house is very lacks warmth. The window shades are not great and a couple of throw rugs wouldn't hurt either. The hot tub was a wonderful addition after long days of walking and the view incredible. Pleased to hear you enjoyed your stay at the Seascape House. Yes, the house is worn; it really takes a beating right at the location that it is at, from the harsh weather and winds, and the salt in the air. It is a constant, but we do strive to do our best. I will definitely recommend to the owners, some throw rugs. We are still working on the blinds and that will make a difference. I am glad you enjoyed the hot tub. 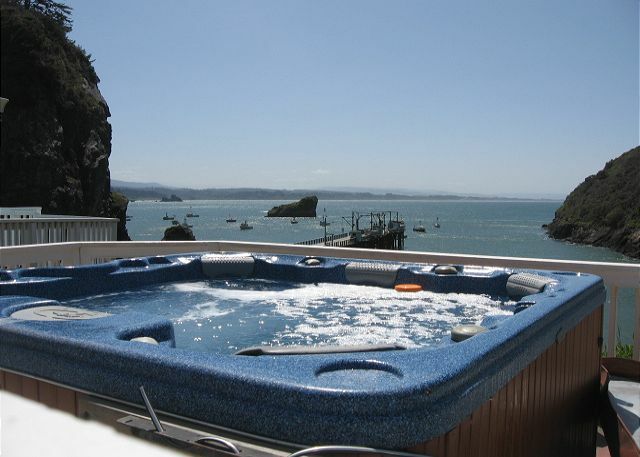 It is wonderful to sit in a hot tub overlooking the ocean view and looking out onto the horizon. Thank you again for your stay. I hope you will visit us again. We enjoyed the beaches, cottage feel and the hot tub. Thank you for your recent stay at the Seascape House. Please come visit us again. Wonderful relaxing experience. Great house. Super clean. Great location and scenery. Great place for families or a romantic getaway. Larrupin Cafe is a MUST for dinner. Beautiful beach walks. Thank you for the review of Seascape House. It is great beach house with such a scenery. I must add, Larrupin Cafe is one of my favorite restaurants! Glad you had a wonderful, relaxing, experience. Thank you for your stay and visit us again. The house is very cute, great location, and amazing views. We loved listen to the sounds of the bay and ocean. We also loved the ease to 101. It was very easy to travel to the parks. There are do many things to do and see! I am glad you liked the Seascape House. 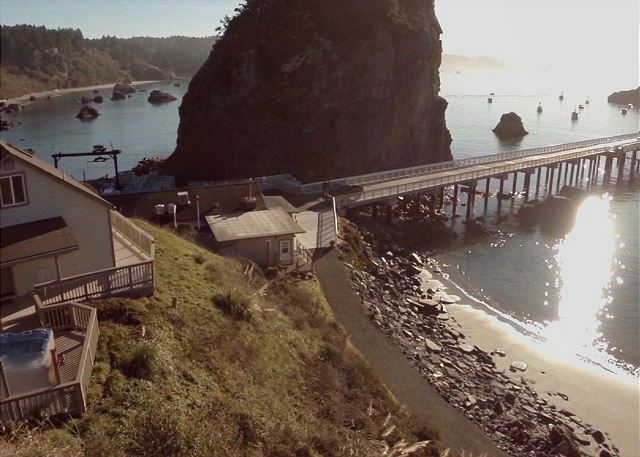 Such an amazing location for a little ol' beach home, right on the Trinidad Head like that. Definitely much to see and do within the vicinity. I hope you get a chance to stay with us again, whether here or in one of our other homes in a different environment than this one. Thank you for your stay. Very unique location. Great for 4-5 people. In need of some maintenance. We had a good holiday here. If you want to go fishing book early ... Like before you arrive. Seascape is in a great location for anyone wanting to enjoy sport fishing. I agree, our fishing season is limited and people come from all over to go deep sea fishing on charters, so definitely book ahead! I loved it. The house was perfect. The sounds of the ocean exactly the purpose. Awaking early to the fishermen and the unloading of boats was delightful. The nightly battle to keep the racoons out of the garbage while taking a hot tub was fun although I lost!! I am glad you loved the house! Seascape is the ideal beach home for anyone who loves the ocean and watching the fishing boats go in and out. So much to see from that house. Sorry to hear about the racoons. We have so much wildlife on our coast at all times. Challenging, but often a unique treat for those who do not have that kind of experience back home. Thank you again for your stay and I hope you will visit us again! Thanks to Jodi for making this easy and fun for my entire family! Amazing and relaxing views from the Seascape is a definite. Great spot to watch the boats go in and out, as well. Please visit us again soon! We had a great time!!! Will definitely be coming back!!! Only complaint is maybe an ottoman or a reclining chair for at the end of a long day hiking and playing. :-). Thank you for visiting from NY and renting the Seascape House, and for sharing that you had a great time. I will pass on the information about an additional otttoman or recliner, to the home owner, but it is pretty cozy quarters in there. Please visit us again! Location, location, location is perfect. Hot tub, excellent although we had trouble with the tie downs on cover. Not for ladies with nails. went fishing with Captain Jack, caught more fish than we could eat as well as more crab. accommodations' are....clean, but Spartan. Glad to have washer and dryer. Not upscale, but beds are comfortable. Thank you for the review of Seascape. That house is in a great location and I am happy to hear you went out and got so much fish and crab! I should have made it your way for dinner (kidding). The house is basic and simple, and it sure does take a beating from that salt air right on the ocean where it is. I am glad you had a great time and hope you return to us again! We had a fabulously relaxing time at Seascape. The house is in a great location, walking distance to town and the restaurant down below. The beach is very fun on both sides, and the hot tub cannot be beat. Watch the lighthouse twirling at night from the warm bubbles! A maintenance issue was addressed right away and we were compensated. The beds were very comfortable and linens fluffy and clean. The kitchen had 3 wine glasses, if you had more adults you might need more, 2 was enough for us. I agree with other reviewer that a coffee table would be nice. Restaurants were great in town, and the little trails everywhere were a bonus. Thanks for a great trip to the coast! Thank you for the great review of Seascape! Glad to hear you were able to really enjoy this house and its surroundings. Thanks for letting me know about the wine glasses. I do hope you return to visit us here again at Redwood Coast Vacation Rentals. Thank you for your stay. Trinidad is a hidden gem. Beautiful quaint coastal community. The house location makes you feel as if you are staying in a light house! Yes, it is an older beach cottage, but extremely well kept. It offers a great experience. Wow, what a great description of Seascape House! I have to admit, it really does feel like you are staying in a lighthouse and I am glad you had a great experience there. 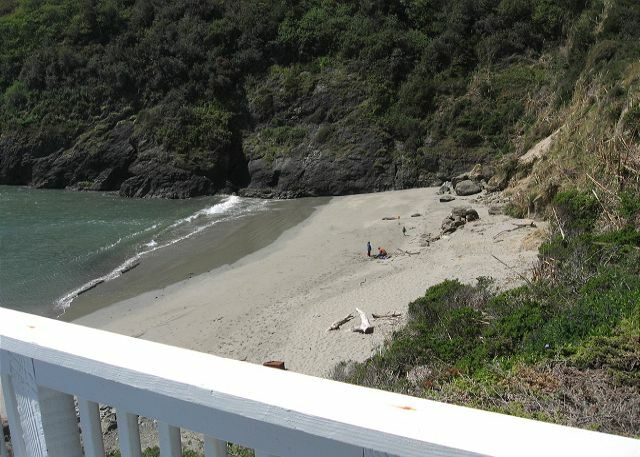 Here at Redwood Coast Vacation Rentals, we have many homes in varying environments from ocean views, inland river access, to forests and pastures. I do hope you will return to stay with us and check out some of these other homes for a whole new experience, as well. Thank you for stay with us. Overall the location and view make this a sweet spot. That said, the unit really needs a thorough airing out and deep cleaning. There was a funky smell to the rental that I couldn't find the source of. The unit was comfortable but could use upgraded bedding and furnishings. Lighting in particular was very poor and a coffee table and end tables are needed to make the living room more functional. I still rate the overall experience a 4 because it met our needs well BUT I would not personally return unless I confirmed that the above changes were made. I suggest anyone looking into this unit ask specifically about the smell being resolved and lighting improved before committing. Note - the hot tub is excellent and new and did push the overall rating up a notch. Thank you for the review of Seascape. I am pleased you had an overall well experience. We were unable to find any odor in the unit, other than that of the bay below. The beds and furnishings were just upgraded and replaced within the last three months and are brand new, as is the hot tub. I will definitely forward your comments to the home owner. We do have over 50 vacation rentals here at Redwood Coast Vacation Rentals, other ocean view homes that may be a better a match. Please give us a call and speak with our reservationist and she will help you find a better match for what you are looking for. We do hope you will return to us again. Thank you for your stay. It was a great house for two plus families to meet up. We were able to walk everywhere and play on the beach effortlessly. The heater was a little tricky with a toddler, but we put the coolers around it to keep him from touching it. The hottub was awesome and it was fun watching the morning fishing activities on the peer while sipping coffee. It was a great stay! Sounds like you had a wonderful New Years! The Seascape House is really in a great location, and it sounds like you were able to enjoy the surrounding area and views. I hope you will be back to celebrate with us again and maybe make this a tradition. Seacape "Escape" in Trinidad. ENJOY! My husband and I had a son and family from Michigan over Thanksgiving. We needed a place that was wheelchair accessible and wanted to find a rental on the ocean. The Suite was just great for us. Our son and wife, who met at HSU, had the chance to show their 2 children what a fabulous area this is. The access to both the beach and the trailhead was great. We live in Arcata and this property filled our every need. The only downside is there is no oven, and over a Holiday, it may be important. The BBQ needs some work, but overall, I highly suggest a stay here. The view is INCREDIBLE. I don't think you will be disappointed. Thank you Cheryl for the review of Seascape. It was a pleasure meeting you. The Seascape is really in a very special location, especially for those who do not live near the ocean. I do hope you return to us here at Redwood Coast Vacation Rentals. We have 50 vacation homes in varying environments for your next great escape. Location was GREAT! Enjoyed our morning coffee on the deck overlooking the pier every morning, 1 1/2 year old grandbaby loved the ocean and being so close we were able to walk several times daily to the beach and play, yet close driving proximity to other activities, the trail adjacent to the property was magnificent easy enough to walk and carry the grandbaby, seven of us total stayed and their was plenty of room. The only down part of the little house on the beach was the cleanliness was not to the standard of a grandma with a 1 1/2 year old, floors needed cleaned when we arrived before I allowed him down, window sills dirty and lil dead rolly polly bugs on the bathroom floor and in the bathtub in the suite. Furniture needs replacing rather worn and tattered, outside chairs old, one actually was torn and when I sat all 126lbs of myself down I fell to the deck, and the bbq is jimmy rigged together and dirty......But those things where overcome by the beautiful scenery.....Maybe management could recommend a full renovation of the furniture and spot check behind the cleaning service they are paying for....Thanks for a good time and we will be returning. Thank you for your review of Seascape, Tammy. I am pleased you had a good experience at the house. It has an amazing view and the trail right by the house is one of my favorites since childhood. This particular house takes a little more maintenance due to its proximity to the ocean. Corrosion can be a battle right next to the harbor here, and the rolly bugs are a constant in Trinidad. The house was vacant for a little period of time prior to your coming in, which may explain the floors. The cleaning manager and myself do check after every cleaning. Thank you for bringing to my attention and reminding me to have a light clean after long periods of vacancy. As for the furniture, the house is currently under renovation and upgrade. All the beds were recently replaced and the owners of the home have been searching for the right furniture for the house. I hope by your next visit all will be new again and you can have a fabulous time here with your family. Unique, charming. Just needed to have light bulb in front porch light for safety. Amazing views, sounds of the sea. Great location, beautiful town. Thank you, Linda! 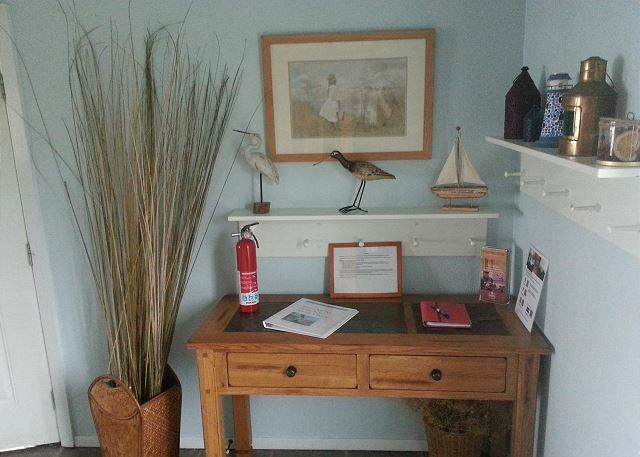 Thank you for staying with us at Redwood Coast Vacation Rentals, at the Seascape House. I will address the porch light right away, thank you for bringing to my attention. I hope you will come visit us again! We had a wonderful time at the SEASCAPE. It's proximity to the harbor, beach and restaurant is almost impossible to beat. It is nice to have your choice of watching the sun set over the Pacific from the hottub, the beach less than 100 yards away or from the top of the spur after a invigorating walk or run to the top.The locals were all helpful and friendly. If we are back in the area we will be staying at the Seascape. Right on! Come on back to the Seascape by Redwood Coast Vacation Rentals or one of our other 50 rentals on the Redwood Coast. after spending a long day in the car it was a pleasure arriving at the cottage. The 360 view is amazing and probably has hardly changed over the last 100 years. House has all amenities and is furnished very cosy. I would only ask the owner to have a look at the bed in the downstairs bedroom as it is really very old and squeaky. Trinidad is a beautiful hidden village which seemed to have stood still in time. 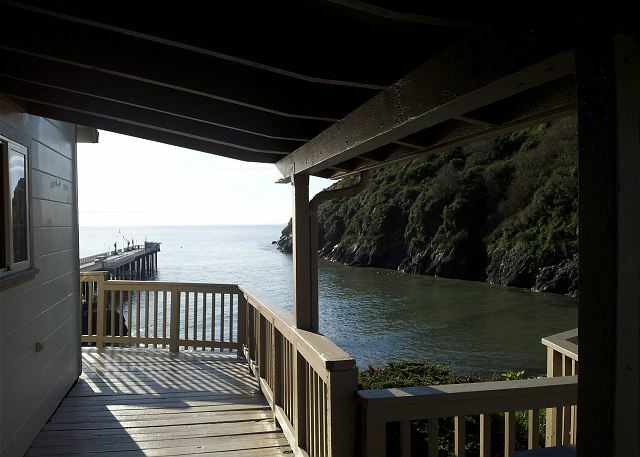 I would recommend this cottage to anyone travelling along the Northern California coast. Glad you enjoyed your stay! We just replaced all the beds in the house on July 27 and put a queen upstairs in place of one of the rooms with twins. Hope to have you back to the Seascape by Redwood Coast Vacation Rentals or any of our other 50 vacation rentals on the Redwood Coast and Rivers. This property has one of the best views in the area. Very good amenities and location. Highly recommended! Great location and house. We enjoyed the stay. Only one comment - the bed in the main floor room makes a lot of noise with any movement. As a restless sleeper, this was a bit annoying. Overall though, we loved the location and everything related to the property was great. Wonderful location. The house was clean and adorable. We also used the suite, which is handicap accessible. Great for grandparents to come too. Sounds like you had a wonderful vacation and that the Seascape worked well for you and your family - Nice having multi-generations together like that! 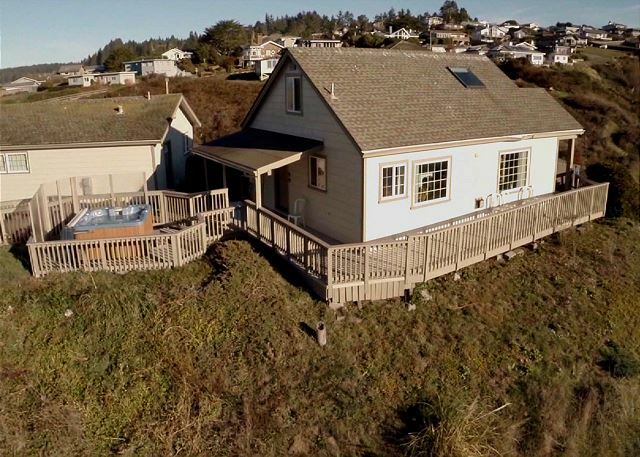 Enjoy and hope to have you back again at the one of a kind Seascape House managed by Redwood Coast Vacation Rentals, or one of our other 40 plus homes in the area. Tragedy brought us to this place. It has since become a family place for us. We come now to celebrate our family. The ocean, the light house and the head all have special meaning to us. Nice stay. We were there with my parents (party of six) Beautiful location but windows in one bedroom couldn't be opened. Sleeping space for six but only 4 chairs at the table. Sharing one bathroom can be a bit tricky with 6 people. I would recommend staying there with 4 people or adding the suite. Yes, getting that window replaced (we just do the same with the other window in that bedroom). And agreed, that 6 people for 1 bath can be difficult - nice adding the suite. The view from the deck and windows was wonderful. 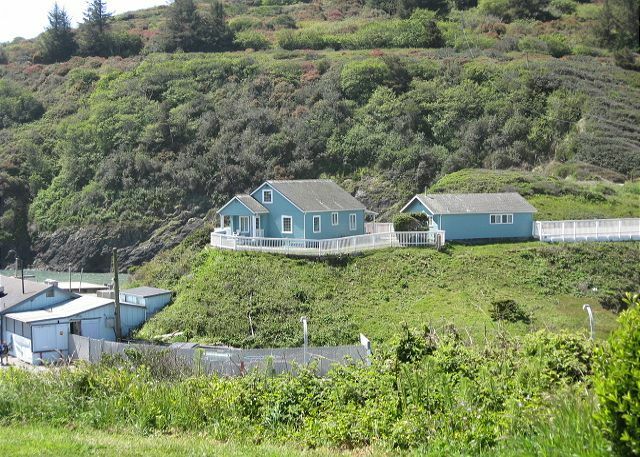 The house is located on Trinidad Head, near the bottom so the Head is to the right, looking toward the ocean. A huge rock frames the view to the left. The pier is seen below the level of the house. In the morning fisherman come and go on the pier; starfish cling to the rocks near the pier. One of the better restaurants is a short walk down the driveway from the house. Really glad you enjoyed Seascape House which, as you mention, is one of the best locations in Triinidad. The location is perfect---right on the bay with spectacular views. The house needs some maintenance work inside and out, and a good deep cleaning, but otherwise a nice place to spend a few days. We enjoyed the town of Trinidad as well as the little beach below the house. Would recommend to friends, mainly due to the location and views. glad u enjoyed the location! yes, we are doing some maintenance work now, including reframing windows, as I write this message. We are also getting new furniture shortly. I will tak a look and talk to our cleaning manager about scheduling a heavy duty deep clean too. Thank you for the suggestion. The house was great. We got to watch the fireworks from the surrounding communities through the kitchen window. I was a little worried about being so close to the pier when I saw the pictures online, but what an amazing location. 3 of 4 views are of the ocean and all are breathtaking. The house is decorated and supplied well (although it could use an oven to go along with the stove top). I have already recommended the house to my friends and will definitely rent it again if I ever get a chance to visit the Redwoods again. A fantastic place to stay! I agree on the oven and plans are in the works to get that done! Have been petitioning owners awhile, but it's not such a simple thing because would entail additional electric panel, but will happen soon. Loved it!!! Coming back next year!!! We hope you do come back! We loved our stay at your wonderful cottage. Very clean and comfortable. Would love to visit again. 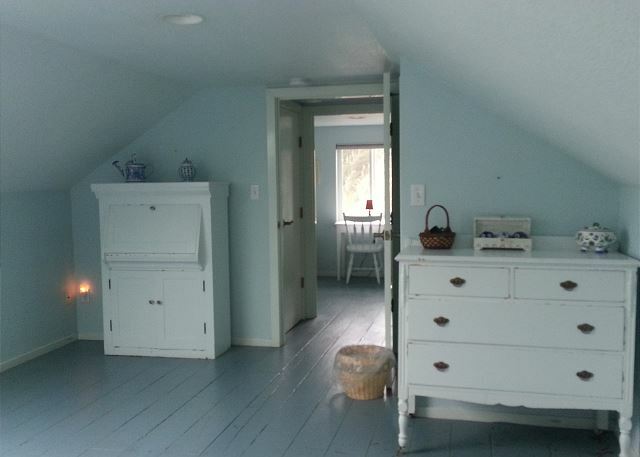 Loved the view & location to beach, etc., the hot tub, washer/dryer, twin beds in upstairs rooms, "Grandma's house" feel. We had a lovely weekend with family and friends celebrating our son's graduation, and everyone commented on what a great house we had found. Room for improvement: SeaSuite needs a closet, or some better way to hang up clothes, and needs cups to go with the coffee pot. The kitchen needs a more intuitive way of arranging items (put pots & pans in one place, glasses all together in another, etc.). Needed a decent corkscrew, and wine glasses. Lamp by sofa didn't plug in (bent). Property manager and cleaning staff very pleasant to deal with. I hope to visit again, and stay longer. Glad you enjoyed your stay and I appreciate your suggestions on the kitchen. Will get the missing items and look at different placement of things if that can work. We could do a portable closet in suite so will look at picking one of those up. ONE OF MY TRINIDAD FAVORITES!!! This was just perfect for our family time at Christmas. Our age group was from 30 years old to 90 and this property accommodated all our was great for us all. We loved the views from every room in the house!!! My favorite was hearing the waves from my bedroom window....great for sleeping!! Also, this was a perfect location for walking all over Trinidad, including Trinidad Head and all the trails....beautiful views from every angle!!! This will be a great location in the summer when the harbor is full of boats!! A perfect place to help celebrate a wedding! The view and the privacy of Seascape couldn't be beat! All our family enjoyed our stay, and loved watching the boats from the hot tub! We loved the Seascape. The views were wonderful and we loved being so close to the ocean and nearby hiking. We also loved the town of Trinidad! THE SEASCAPE IN TRINIDAD--GREAT LOCATION! We had an enjoyable week in the Seascape atop a bluff that looks out to the Harbor in the eclectic town of Trinidad! It was so enjoyable to sit on the back deck reading while listening to the surf break on the beach. The hot tub was great to relax in, and the location of our rental property was great--we did a day trip north into Oregon and stopped where we liked along the way, and a day trip south and did the Avenue of Giants. The Redwood trees are awesome, as is the gorgeous Pacific coast. The house could have more comfortable living room furniture, as well as a less-squeaky master bed! Otherwise, very enjoyable stay. Thank you Red Coast Rentals. I have enjoyed staying at many properties through the years when my daughter was in college as HSU. It was a long trip from Ohio, but the view and accommodations were always worth it. And we always had a nice, roomy place to stay, cook, relax, and visit with my daughter. Thanks! I love the spot, such an amazing view over an epic seascape :) The property furniture was a little old and showing signs of poor maintenance but nothing that can't be fixed! The overall stay went well and I would be happy to return. Thanks for providing an amazing location to relax and enjoy for myself and out of town artist. Yes, we will be replacing the furniture that needs it over the next few weeks. We put in quite a bit of new furniture about a year and a half ago and will replace more of the older furniture. Loved it - want to come back!! Very comfortable house for 6 adults. We loved our house on the bluff. My niece asked if we can come back next year as soon as we got there. Most important, we had a need to call maintenance and received prompt, courteous service from Reid - he was awesome. Thank you so much for all your help. We will definitely look to return at some point!!!! Great beach cottage with an excellent location. Everything inside the cottage was clean and in excellent condition. The views of the pier and beach were breathtaking. I especially enjoyed watching the fishermen row out from the pier to their fishing boats every morning and then seeing them come back in the evening with their baskets full of crabs. The Seascape restaurant below is excellent, whether it be breakfast, lunch or dinner. We would recommend this to anyone who loves the ocean and beach. Looking forward to coming back again soon.